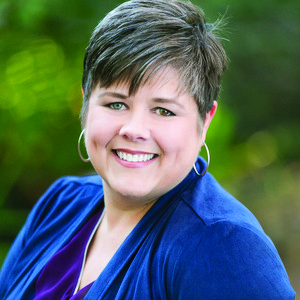 In my years as an office manager and later as a consultant, I learned that one of a new dental office managers’ most difficult tasks was to collect money that had been sitting on the books for months (or sometimes years). Frustrated business administrators frequently share how they took a new position and ended up “walking into a mess!” That can be a difficult situation when you are the new face on the team. I would like to suggest a “one bite at a time” approach. Having some time to settle in, get to know the patient family and gain trust is critical to your long-term success. Executing the strategies below will help you start the ball rolling on receiving payments while you work to build rapport with patients. “Accounts Receivable” is all monies owed to the practice, whether from insurance or patient. It is found on the Aging Report in Dentrix or the Account Balance by Responsible Party in Eaglesoft. All practice management software programs offer a similar report. It is important to filter out the credit balances (monies that the practice owes – either to the insurance company or the patient, and not a part of this discussion) when determining the true A/R. Both Dentrix and Eaglesoft (and likely most of the others) have this capability through filters. If you are unfamiliar with how to do this, contact your support services. The benchmark or standard goal for A/R will be between 50 and 100 percent of average monthly production. This means that if your practice produces an average of $100,000 a month, all money owed to the practice should not exceed $50,000. This varies from month to month because of the fluctuation in production and is dependent on factors such as posting full office fees vs. allowable fee schedules, participation in insurance plans, collecting patient portion at the time of service, etc. Work with your consultant to determine where your ideal A/R should be. Strategy #1: Send a statement to the patient immediately after filing dental claims, and insurance has paid if there is a balance due or if the patient “forgets their checkbook” and doesn’t pay at the time of service. Don’t wait until your statement cycle. Unless the account or ledger is a total mess, usually a quick review should inform you when the family owes money to the office. Also, even if there are other claims outstanding on the account (if a balance is due from any date of service), send a statement. After posting the payment from insurance, generate a statement. Once you have entered all the payments, post these statements in the mail; better yet, send them electronically through your software. It is a huge time-saver and allows you to spend more of your time working on productive tasks. Strategy #2: Always include a due date (I would recommend ten days from statement date) and include the date on the statement. When a patient is given a deadline, they are automatically spurred to action more than if they don’t have a specific timeframe to complete a task. Instead of a general note (i.e. “due 10 days following receipt”), create the setting to read “payment is due by November 13, 2018.” In my experience, 10 days is the magic number. Five days is too short if the post is delayed and 15 days seems just long enough for people to forget. Try adjusting to 10 days and see if it helps! Strategy #3: Send statements every day instead of monthly. Don’t panic! I don’t mean that you should send a statement every day to every patient who owes you money! Most programs will have an option to include or exclude patients or accounts based on when the last statement went out. I recommend a short cycle of three weeks, which means that if a statement were printed within the last three weeks, another statement would not be generated today. The earliest will be on Day 22 unless they pay in full before that date, in which case no statement will be generated. At first, there will likely be a huge number of statements. But as the payments start to come in, and you are sending statements according to Strategy #1, the statement numbers will begin to even out. Now, I know that it could take some research to untangle the mess on some of the accounts, and some of these balances might be quite old. The accounts will generally fall into three categories, so if you have the option of setting aside difficult accounts prior to that first statement run, utilize it. It will take time to tackle these last two categories, and getting paid on these balances will take further communication from the office. You and your doctor will need to agree on a dental management strategy and create a series of phone calls and/or letters to send with the statements, discussing the patients’ options for payment. Work with your consultant to create a workflow that integrates with your software and is as efficient as possible. Reducing the outstanding balances in the practice is hugely rewarding and can earn your doctor’s appreciation and gratitude quickly. By implementing the three strategies above, you can generate incoming revenue while you work to build relationships with your new patient family and decipher the accounts that need your attention. A recipe for your success! 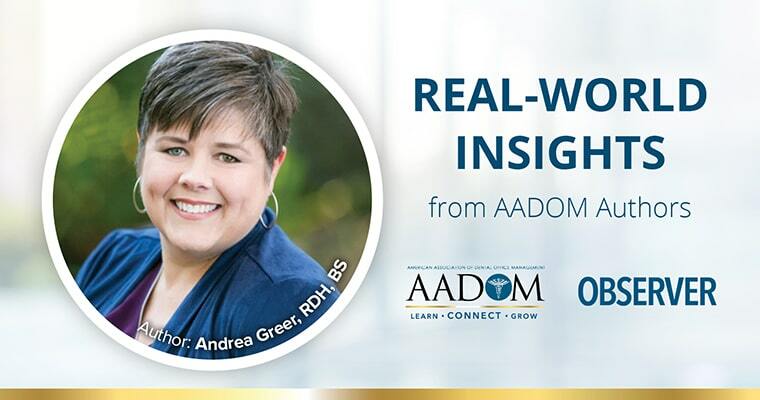 Founder of On Point Dental Consulting, Andrea Greer, RDH, BS brings over 25 years of experience in clinical excellence, workflow management, software training, and communication expertise to connect with team members and doctors alike. 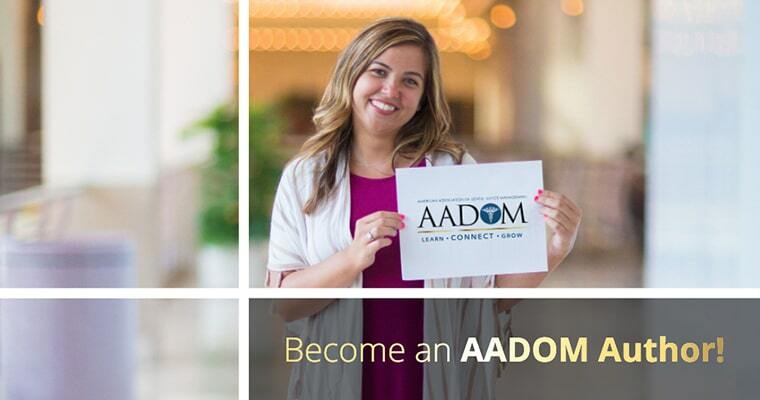 Passionate about improving case presentation, leadership in dental office management, communication and the dentist’s experience in business, she finds speaking and her work with teams deeply rewarding. Visit www.OnPoint.Consulting for more information on dental manager insurance training.